Take the Downtown Exit off of Interstate 10. Go down the ramp, which will turn into Willow Street. Continue on Willow Street until it intersects with Bowie Street. Turn left on Bowie Street and go one block. Our building is on the Southeast corner of the intersection of Bowie Street and Orleans Street. Take the Martin Luther King Exit off of U.S. Highway 69. Turn right on MLK. Continue on MLK until it intersects with Bowie Street. Turn right on Bowie Street. 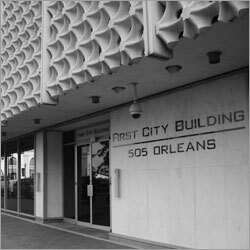 Our building is on the Southeast corner of the intersection of Bowie Street and Orleans Street.